Having thoroughly enjoyed the preview performance on 15th March, one can justifiably say – they certainly do! I have long admired Terry King’s fight arrangements, but this time he has excelled in every possible way, supported by the committed members of the ensemble who are involved. You really feel they mean business with their weaponry and if David Carr’s magisterial Escalus had not intervened during the first brawl there might have been more corpses on the stage than called for in the text. 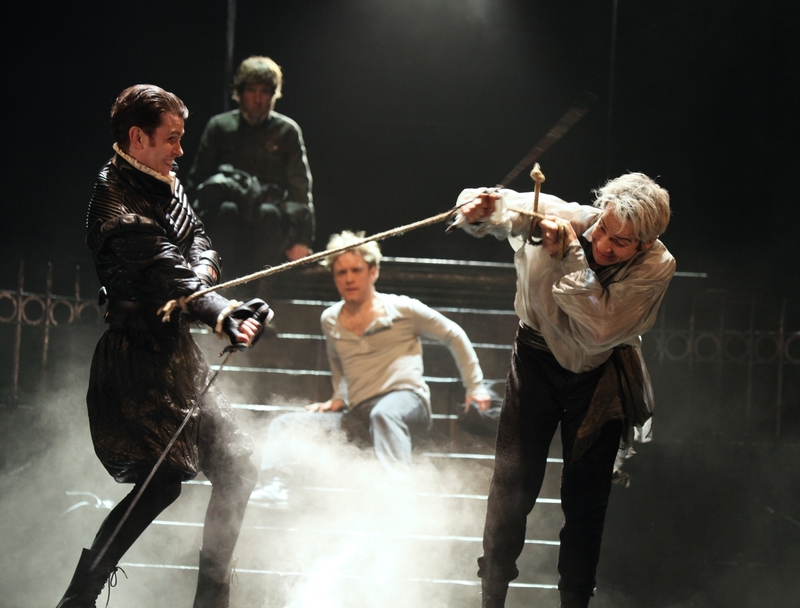 As it was the deaths of Mercutio, Tybalt and Paris are symptomatic of a community where cold steel (and a rope) are used to settle disputes in preference to parley. It is also the first production of the play I have seen where Lady Capulet and Lady Montague are quite ready to inflict damage on each other during the first brawl, whilst their husbands show they can certainly stand alongside the younger members of their houses when it comes to swordplay. I was interested to note that Michael Billington has drawn comparisons with Zefferelli’s1960 production. Like the latter (as well as the fights) the Capulet’s ball is quite memorable as are the performances (in my view, much stronger in this fantastic RSC staging by Rupert Goold). The title roles are splendidly played with great aplomb and depth by Sam Troughton and Mariah Gale supported by memorable performances from all the other major characters and the company in general. As with the recently opened KING LEAR, we have ensemble work par excellence and a text spoken with great meaning and relish. Bravo to all concerned! I now eagerly await the Public Understudy performance on 30th March.